set a benchmark for facsimile editions"
This manuscript is the largest international anthology of polyphonic music of the early 15th century. It was compiled in the Veneto, in Padua in the early 1420s (stage I) and Vicenza in the early 1430s (stages II-III), all copied by a single scribe between 1420 and 1435. The three illuminations are an unusual luxury for a musical manuscript at this period. It was acquired by Padre Martini in 1757 and is one of the great treasures of his library in Bologna. About half of its 323 compositions are unique; some others are shared with and complemented by the slightly younger Veneto manuscripts Bologna, Biblioteca Universitaria 2216 and Oxford, Canon. misc. 213. It is the most important source for the works of Zacara and Ciconia and for the early works of Guillaume Du Fay (with 78 works, nearly a quarter of the manuscript, many of them unica). About 50 composers are represented, including native Italians, and composers from the north who were sought after and made their careers in Italy. It is primarily a collection of mass movements (mostly Glorias and Credos, and a few cycles) and motets. Du Fay's Missa Sancti Jacobi was assembled as a cycle only here, and can now be linked with the circle in which Q15 was compiled. The 109 motets include compositions in honour of Gianfrancesco Gonzaga, the Venetian doges Steno, Mocenigo and Foscari, the prelates Stefano Carrara, Albano Michiel, Pietro Marcello, Francesco Malipiero, Francesco Zabarella, Antonio Correr, Giovanni Contarini; the Dominicans and Leonardo Dati; Pandolfo Malatesta da Pesaro, Cleofe Malatesta; Eugenius IV, Eugenius and the Emperor Sigismund. 19 French songs were added at the end of stage I, and 11 laude at stage III. Other late additions are the cycle of 24 hymns (including the earliest form of Du Fay's cycle), 9 Magnificats and 3 sequences. Despite the predominantly sacred contents, the manuscript seems to have been used at least as much for pious recreation as for liturgical observance. It can be associated with the humanist circle around the Venetian patrician bishop Pietro Emiliani of Vicenza, which drew on a high level of local musical competence that was continued under his successor, bishop Franceso Malipiero. For the first time, the complex codicological history of this manuscript is unravelled and the importance of its many revisions examined. The first compilation was originally much larger, as can be attested by earlier foliations and over 90 capital letters cut from it, to be pasted into the later form of the book that we now have. Fragments of music on the backs of these letters attest an earlier dating for compositions only known from later copies, sometimes in different versions. About 200 folios were discarded, and replaced by new repertory and by pieces recopied from the older book. The manuscript thus now embodies two overlapping, superimposed anthologies, with a third of their physical material in common, and perhaps half their repertory. Far-reaching conclusions can be drawn about the scribe's changing tastes at all levels, from repertorial to notational. He discarded some motets, but retained the verbal texts of occasional pieces for dead doges and bishops, while updating them musically. Inferences about what he rejected, and what and how he recopied or changed, bear upon future repertorial study in general, and the evaluation of, for example, contratenor parts and the pairing of Gloria and Credo movements in particular. These findings are especially important for Du Fay, to whose new work the compiler seems to have had prompt access over a long period. Margaret Bent tells this story in her extensive introductory study, which also includes comprehensive indexes and catalogues. She spells out some of the conclusions to be drawn from the partial destruction of the manuscript by its own creator, a unique and extraordinary testimony to changing taste and contemporary reception. 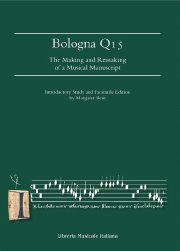 Bologna Q15: The Making and Remaking of a Musical Manuscript. Introductory Study and Facsimile Edition by Margaret Bent. Volume I: Introductory Study. Volume II: Facsimile. LIM Editrice: Lucca, 2008. 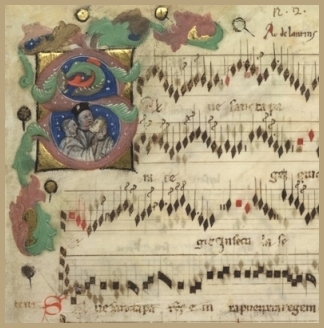 Ars Nova, nuova seria, 2. format: 24.5 x 32.5 cm. 2 vols, 400, 686 pp.